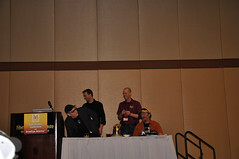 One of the events that I attended this past week at the Craft Brewers Conference was titled, “The Gourdians, Pt.2 – The Pumpkin Strikes Back.” David Buhler of Elysian, Greg Koch of Stone, and Marty Jones of Wynkoop are the eccentric trio that makeup the Gourdians, and no one knew quite what to expect from their session. Slated for 8:30am Friday morning on the schedule, it seemed like a tough draw to get a ballroom full of brewers to attend that early. 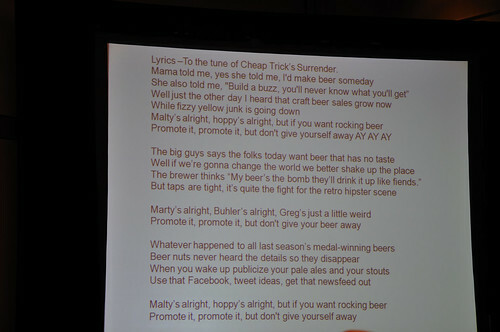 During the opening session of the conference on Thursday, the group staged a pirated take over of the presentation feed during Paul Gatza’s (Director of the Brewers Association) intro and industry summary, and they ran a cryptic “commercial” to lure people to their session. In addition, they had also passed out bags of snacks (pumpkin seeds) with an ad for their session. The session turned out to be packed with people, which is an impressive feat for that early of a time slot. The panel admitted that half the fun of this session was the marketing aspect of trying to fill the room, and they succeeded. Once they got us there, they discussed some of the ways that they market their own businesses, and what others can try to do to make their own businesses grow. Many in the audience knew that with these guys it wasn’t going to be cut and dry. Towards the end, they brought out Rick Nielsen of Cheap Trick, who happens to be an investor in Piece Brewery in Chicago, to help play guitar on a version of the hit song Surrender. The Gourdians had altered the lyrics to relate to the craft beer industry, and they had the crowd sing along. Rick seemed to think the wording needed a little work….but, it is an entertaining video to check out nonetheless. Seattle’s own David Buhler had the pleasure of accompanying on acoustic guitar, and he shines on a couple of short solos at the request of Rick. Cheers to David and the rest of the Gourdians for putting on such an entertaining show that early in the AM! Song lyrics to Promote It! Thanks for being quick enough at that hour of the morning to get the video. I didn’t think about it until a little after they started and was kicking myself for not doing it.